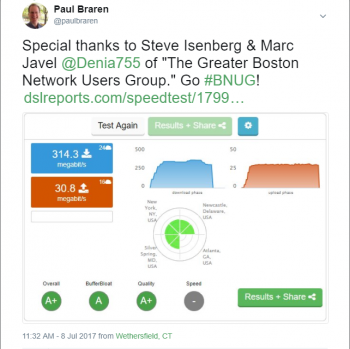 This article was originally intended for my audience at The Greater Boston Network Users Group at their July 11th meetup. Until I'm able to do a complete configuration walk through, this spot in a recent "Network Enthusiast" EdgeRouter video I created gives you a good look at how DNS is supposed to work in Windows + Linux and/or VMware vSphere home lab environments, only using this little metal box router. Look mom, no Microsoft AD/DNS/DHCP required! This Ubiquiti EdgeRouter Lite (aka, UBNT ERLite-3) is available at Amazon, B&H, Newegg, and Wiredzone. These are affiliate links, full disclosure below. Steve Gibson brags about his beloved $65 "EdgeRouter X" on many Security Now podcast episodes, an even smaller router that uses the same firmware family. But the EdgeRouter X doesn't specify that it can also do a million packets per second. I wanted something fast enough for my home's 300Mbps/30Mbps connection, with a bit of future-proofing for even faster internet speeds someday. Even with a year of daily heavy use already behind me, I don't suspect I'll want or need to swap my ERLite-3 for some years to come. The ERLite-3 has been around since 2013, still pictured in it's original plastic body on Amazon. They're made of metal now, and has gained a lot functionality ever since through regular firmware updates, see full history here. This "networking enthusiast" router has enjoyed a lot of popularity in the market, with mostly-favorable reviews on Amazon and on Ubiquiti's forum. I've personally owned two of these little ~$90 routers for about a year, one dedicated to my traveling home datacenter right, and the other used heavily full time by my entire family, with better reliability than every consumer router I've used before it. ETH0 at left is connected to my cable modem, ETH1 connected to my gigabit switch, one of my 3 eero Wi-Fi devices is pictured at right, using SlimRun gigabit wired backhauls to the same gigabit home network. I rely on my ERLite-3 for all my home network routing, DNS, and DHCP functions, leaving the Wi-Fi duties to my wired-backhaul eero 3 pack Wi-Fi that I configured for bridge mode. This combination, wired up to my DCOSIS 3.0 SB6183 cable modem, gives me a consistent 300 MBps down and 30 Mbps up speed from anywhere in my home, whether I'm wired or wireless. Hard to not be happy with that. 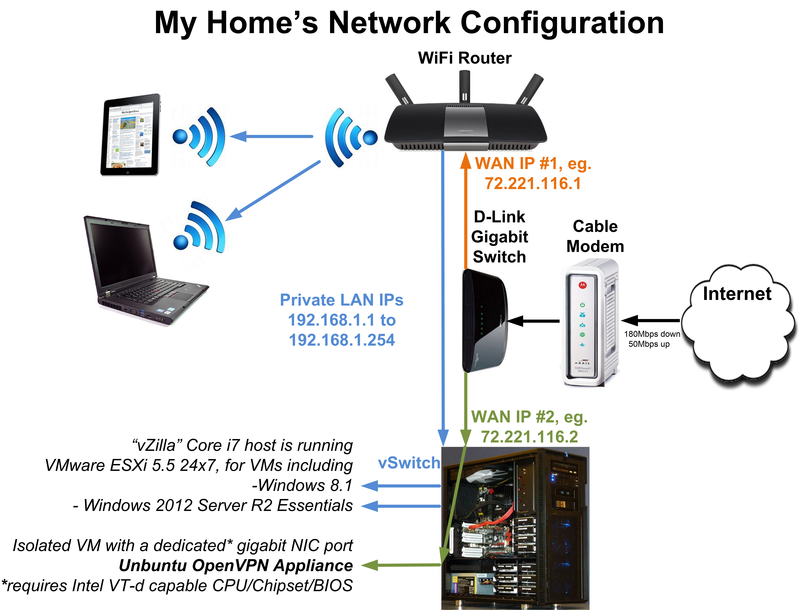 The deployment overview will hopefully help newbies make this little metal box behave much more consumer-router-like. Don't bother configuring the router with the default firmware, update it first! All the steps are detailed below. Download here. This is the latest release, it arrived in April 2017, and was just a security update, with no new features since December 2016's 1.9.1 release. Read all about 1.9.1.1 in the forums and release notes. You can also see future release announcements at the EdgeMAX Updates Blog that even features a handy RSS feed. 1.9.7 is in beta now, sign-up for access to the beta forums. When 1.9.7 is released, it might not have the DNS shortname fix incorporated, and it won't have OpenVPN vulnerability fixes, but 1.9.7-hotfix.1 will. Future release with many new features and fixes. Date TBD. can't be used in conjunction with UPnP, causes only first tunnel connection to work, subsequent connections from same or any other device require router reboot, note that UPnP shouldn't be turned on anyway, which I explained back in my consumer router days here and here. Presenting at New York City VMUG July 24 2014, “Insecure about using public WiFi? 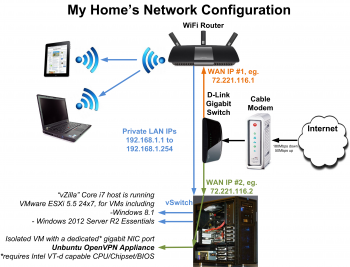 Connect to your home’s OpenVPN appliance, for free.”. dnsmasq seems more desirable for DNS/DHCP, since it may eliminate duplicate DNS admin overhead (see screenshots below), but it won't be available until the 2.x firmware release. correction, see Jul 31 2017 update below! For proper VMware forward (both FQDN and shortname) and reverse (IP) DNS lookups, which happens to help Windows and Linux systems also get to know one another on a first name or full name or IP basis, here's the steps. If your ERLite-3 is new, be sure to update the firmware first before bothering to configure anything at all! 1.9.1 is available here, with video that guides you through the simple firmware update process here, using a laptop/PC/mac directly attached to eth1. When the firmware update is complete, you will be prompted to reboot. a. Power up your network-connected device, which by default will request a DHCP lease. Admittedly, implementing the DHCP reservations and making the name entry is easy enough, it's maintaining the discipline to make all future changes in both places that is a bit tougher. Maybe dnsmasq will change all that, hopefully eliminating the need to both create a lease entry and create a duplicate DNS entry. But in all releases to date, the DHCP Lease GUI doesn't yet support dnsmasq. Taken with 1.9.1.1 firmware loaded. 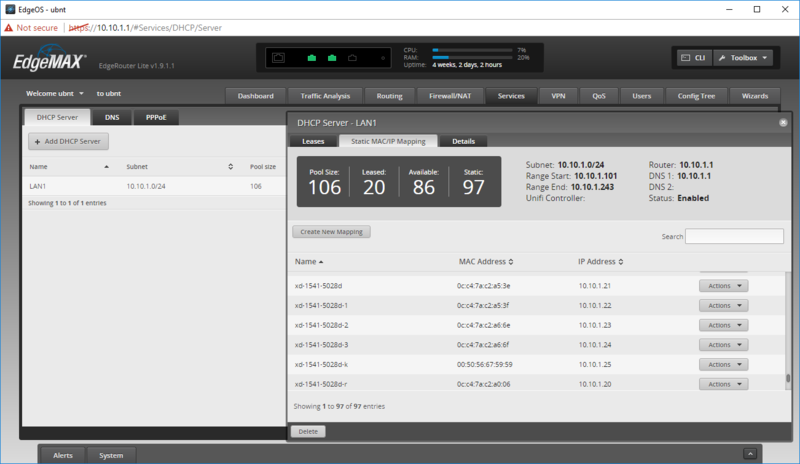 The main Dashboard view, it's what you see when you first log into the router with your browser. Traffic Analysis view is availabe because I've turned on Deep Packet Inspection and left it on, which seemingly hasn't slowed things down at all. DHCP Server Static MAC/IP Mapping view. New firmware has arrived! See Release Notes v1.9.7, forum thread, and ERLite-3 download. 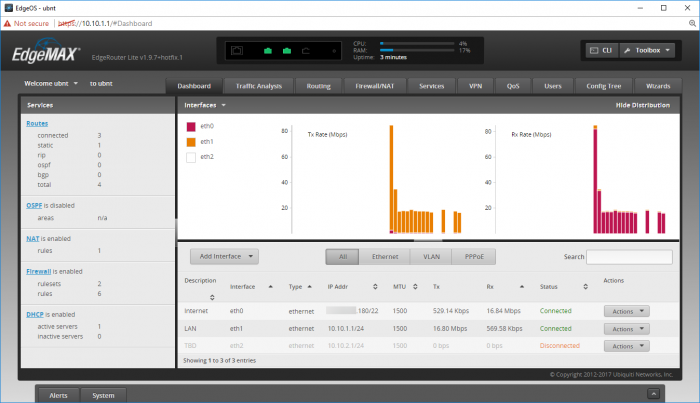 ER-X SFP updated fine via GUI. When using dnsmasq, the entries configured under "static-mapping" will be translated to statically assigned A records in dnsmasq (using the dnsmasq host-record directive). If a client with a static-mapping entry sends a DHCP request with a different client-name, that client-name will be ignored. My first tests seem to be going well, so far, with all static DHCP leases migrated over to the dynamic section, just as the above paragraph describes. In other words, I can now just pick my new device's DHCP lease from the GUI, set a reserved IP for it, and I'm done. No more duplicate efforts to add them to the Wizard / DNS host name / Static host names area anymore, they automatically appear in the Dynamic host names area right below it. Nice! I can't get shortname DNS queries to work yet though, but FQDN and reverse are working just fine. After an upgrade from v1.9.1 to v1.9.7 Hairpin NAT does not work. so this is something I'll definitely need to test, as I use hairpinning regularly. I'll also be re-testing IPSEC and maybe even a secure way to configure UPnP for use with whole-home network usage monitoring via NetWorx, we'll see. With 1.9.1.1, turning on UPnP would cause my IPSEC VPN to only work once, with all subsequent connection attempts failing. On July 31 2017, I began upgrading my TinkerTry home network from 1.9.1.1 to 1.9.7, after making sure I had my current configuration saved of course! Me testing literal copy-and-paste of Ubiquiti's instructions, just to see what happens. This is what happens if you take every line of instruction way too literally, just me testing it verbatim, ready to reset to known-good easily at any point I scrogg things. I have some more tweaking of their instructions to do, to get this right. 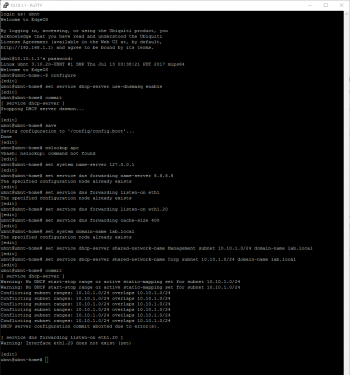 I do wish there was a GUI for this migration from ISC DHCPD to dnsmasq. Testing still underway. Rather important I get lab testing right, so when I deploy it into "production," aka, running my family's home network, it better run well! It also has to do all the basics I need it to do for all my VMware vSphere infrastructure and VMs as well, keeping my Linux and Windows OSs talking to one another on a first name and full name (FQDN) basis. My plan is to help refine and simplify the entire process of configuring this router when it's first unboxed, greatly improving the out-of-box experience for new owners, especially those trying to configure a VMware VCSA-friendly network (forward FQDN and shortname & reverse lookups), with no need for Active Directory or Windows Server licenses, and no need for Linux skills required. Might be a pipe dream, but I try! already use just the webUI for all DHCP reservations, and after the upgrade, I removed all the Static host mappings anyway, since they were all auto-migrated to the Dynamic host names area, and from here forward, I just fire up a new device, find it in DHCP leases, give it a reservation, and I'm done, forward and reverse lookup instantly work from all Windows and Linux PCs and VMs on my network! This all boils down to the shorter instruction set below. Disclaimer: I'm no networking expert. While you may find these instructions helpful, published here for informational purposes and my own reference. I cannot possibly provide support should you run into issues, there's so much that can go wrong. Please instead post your v1.9.7 question(s) in UBNT's excellent forum. Click on the System button along the bottom edge of the Web UI. Select Configuration Management & Device Maintenance / Back Up Config / Download backup config file / Download and save the file in a secure location. Here I demonstrate that I have a working configuration, where DNS lookups by IP, by FQDN, and by shortname all function perfectly. We'll repeat this after the upgrade to make sure everything is still working as it should. See Release Notes v1.9.7, forum thread, then download your ERLite-3 firmware, and save it in a folder you'll remember. Currently, this feature must be enabled using the CLI as there is not a webUI option to enable dnsmasq. Open an SSH session and authenticate. I would not recommend the CLI icon in the Web UI, instead, a separate SSH client is preferred for many reasons, including easy cut-and-paste. To allow local hostname resolution across networks, the following changes will need to be made to allow clients to use the router address as the DNS server, configure DNS forwarding options, and set the system name-server. This will also require setting a domain-name on the router and adding this domain-name to the dhcp-server(s) to distribute to clients so local hostnames resolve properly across networks. A. Set system name-server to loop back to the router itself, which will forward requests to the DNS servers set in the DNS forwarding settings. B. Set global name-servers to resolve all external resolutions. Note, you should be sure that a public DNS server is not manually set on a client on the same network. For example, if an address like 8.8.8.8 is manually set on the client, it will prefer that address over the router's address issued by the DHCP-Server, so it won't be able to resolve names on your local network. 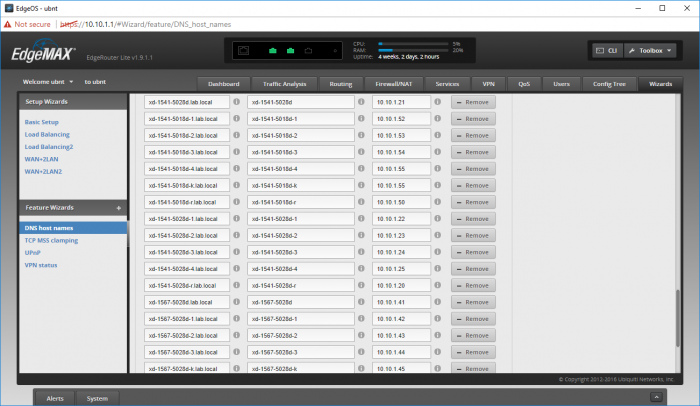 C. Set DNS forwarding listen-on address for all LAN interfaces including VLANs. E. Enable Turn on UPnP2 - Optional - all UPnP is off by default, UPnP2 is the more secure kind with no GUI way to activate it. Works with NetWorx' "Monitor my router rather than this computer" feature). F. Use commit to make all changes active and persistent. 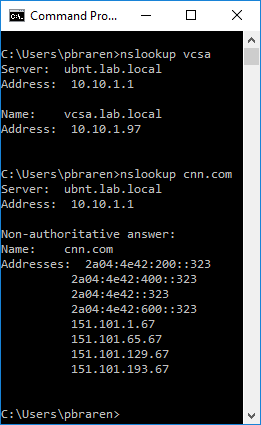 With the release of v1.9.7, and after following the instructions above, DCHP leases are now shown in the webUI, much like they did when using (default) ISC DHCPD for DHCP. You can choose any of the Leases, and configure a reservation. Try browsing the web from a system attached to ETH1, if it works, now try the web UI for something on your local network by Linux-based (no NETBIOS) device that you've given a DNS reservation too, such as https://vcsa.lab.local and if that works, you're really done. 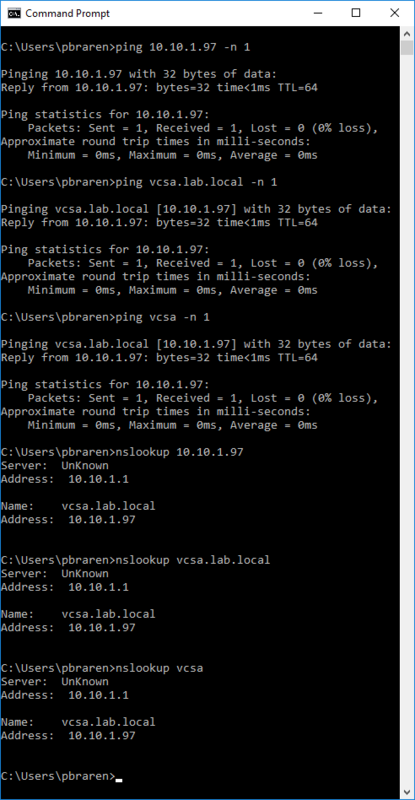 If having trouble, first ping the local IP of the device, then ping the hostname, then ping the hostname with the domain-name. This should help you narrow down where your DNS configuration issue might be. 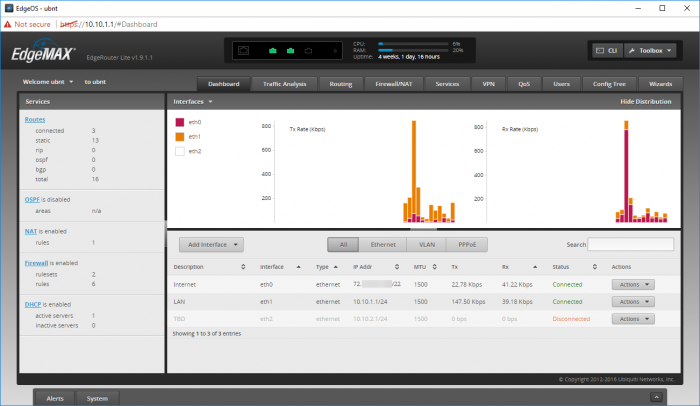 On mobile cellular connected device outside of your network, connect the IPSEC VPN, then see if DNS works by trying a Web UI or SSH session to a known device on your home network, using IP first, then FQDN then shortname next. If you use port forwarding, try accessing that device as if you're remote, but you're actually on your private LAN. If hairpinning is working, your access should work fine. Prior to step 7, you should make sureyou've tested out all crucial functionality. A. If your testing went well, to make all the changes you made persist across reboots, save your configuration. B. If your testing didn't go well and you don't wish to troubleshoot it, you can easily revert your configuration. Added UPnP2 implementation steps to the configuration procedure above, which was using techniques discussed in this UBNT thread. [OpenVPN] Backport patch for multiple OpenVPN vulnerabilities (CVE-2017-7508, CVE-2017-7520 and CVE-2017-7521). Discussed here. I have made the move to EdgeRouter Lite v1.9.7+hotfix.1, the next few days of heavy use will reveal whether I'm happy with it or not. So far, so good. Sometime ago I reported that I was having issues with my L2TP/IPsec over the cellular network .... my symptoms where that I was timing out consequently my VPN connection failed until I rebooted my ERL --- after reboot my VPN would work for a period of time then time out again. Once I got to the commit command listed above, the resolution of the problem was seen immediately. I was able to reconnect my VPN right away, no need to reboot my ER3-Lite. Tried it out for a day, still working great. 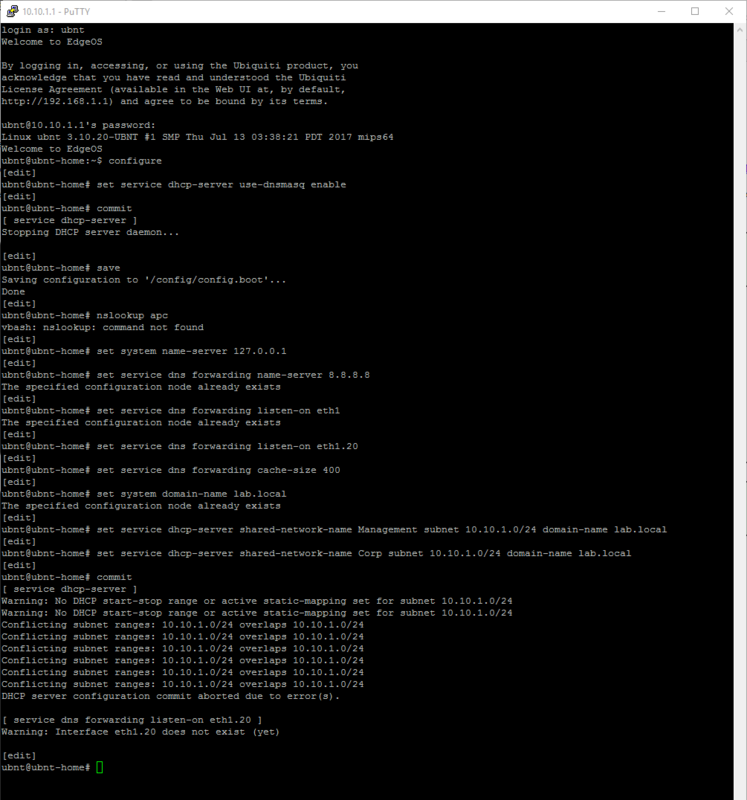 So I then typed save to preserve this new configuration across reboots, and finally exited my SSH session. Done! Everything about my ER3-Lite is configured exactly the way I always wanted it to work, I can now move on to so many other projects. I'll likely be adding this to my configuration procedure, as documented above. Change made, let's see how it goes. It's actually not just the 4500 via UPnP issue, it's an OS counter that runs out, so after a few days of operation, Networx live display of the router's speeds show 0. The full function of Networx is immediately restored by just restarting the router. Well, that's a rather disruptive workaround. I'm still on the lookout for a better solution. Anybody gone one? and so far, it seems to be working the same way as the previous 1.9.7 releases. This has been a busy few months of bug releases by UBNT. 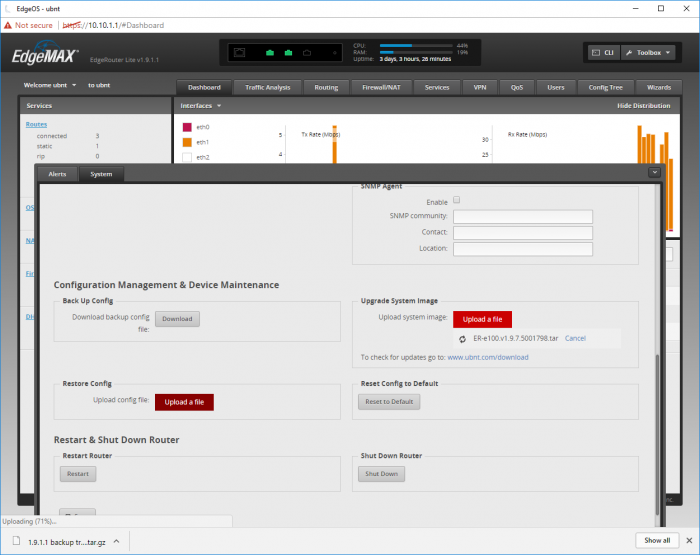 Interested in settings up Quad9 on your EdgeRouter? Make note of the results. Currently, this feature must be enabled using the CLI as there is not a webUI option to set DNS forwarding. Open an SSH session and authenticate. I would not recommend the CLI icon in the Web UI, instead, a separate SSH client is preferred for many reasons, including easy cut-and-paste. In this example, I have only one DNS set to Cloudflare DNS at 1.1.1.1, and I change it to Quad9 DNS at 9.9.9.9, then save my changes so they'll persist across reboots. Back at the Windows command line. Make note of the results, comparing with what you got before, they should be about the same, but for local systems like my example of vcsa.lab.local, you'll need to substituate that with a local system's name that you actually use. Go ahead and try browsing the web to be sure your browsing seems to be functioning just fine too, of course. Prior to saving the change you made above, you should make sure you've tested out all crucial functionality first. After I used the System button at the bottom of the Web UI, I entered my syslog server name under System Log, Log to remove server, and set the Log Level to informational, details here. I apparently then managed to forget to set a firewall rule to allow syslogging to work at all, here's the fix. On the Firewall/NAT tab, click on the Firewall Policies tab, then click on the Actions drop-down menu to the right of WAN_LOCAL, and select Edit Ruleset. Click on the Add New Rule button, and on the Basic tab, in the Description field, type Allow syslog, in the Action area, click Accept, and in the Protocol area, click UDP. Click on the Destination tab, and in the Port field, type 514 then click on the Save button, and wait for the save to complete. Now re-order this new rule, moving it up to the second to last position, right above the last row called Drop invalid state, then click on the Save Rule Order button. 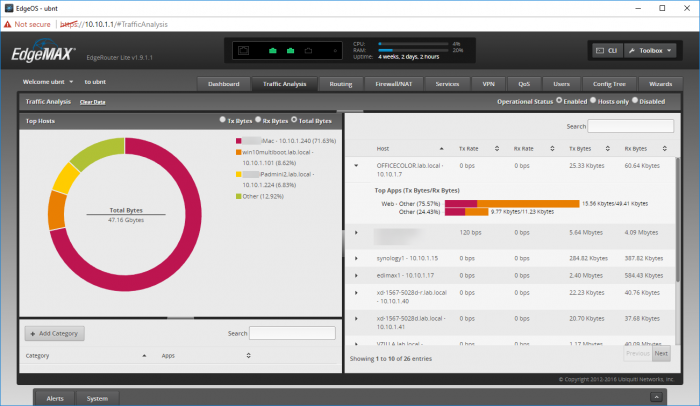 EdgeMAX EdgeRouter software version v1.10.0 has been released! With Quad9 and Cloudflare DNS now available, I've added an updated screenshot above that includes both. I was able to fix my issue with Networx by cutting over to SNMP monitoring instead of UPnP2, which was never desirable anyway, even though I passed the GRC Shields Up test since it was only implemented on my LAN side. Here's how. and save it somewhere safe, with a clear, descriptive filename. If you are unsure, after the commit command, test everything out for a few hours, if all seems well, go on to typing save, then exit, then then exit again. This makes the changes persist through reboots. If it didn't go well, type exit discard, then exit, then exit again. 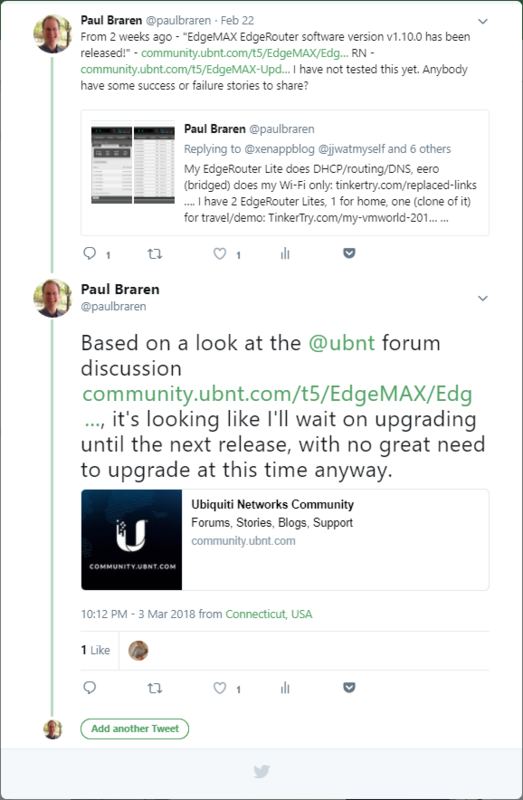 See also my related UBNT forum post. I updated to NetWorx Version 6.1.1 64-bit installable, and it works quite nicely, with my home's upload and download speeds monitored live from up to 5 systems around my home, all covered by one well-worth-it $25 license, see also SoftPerfect's full set of utilities here that I admittedly haven't yet tested. All EdgeRouter articles at TinkerTry, choose Sort by: Date. Dec 07 2016, includes the BOM (Build Of Materials).